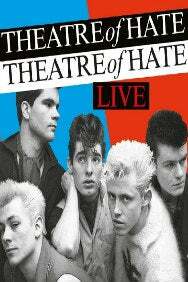 We do not curently have theatre tickets available for Theatre of Hate. This could be because we have simply sold out or it could be that this show is no longer running. The information on this page remains purely for historical and informational purposes. Theatre Of Hate’s debut double-A-side single, “Legion”/”Original Sin”, topped the independent chart in 1980, and “Westworld”, their debut album, produced by Mick Jones from The Clash and released in 1982, held the number one position for 21 weeks. The single taken from the album, “Do You Believe In The Westworld?” has become an anthem. Theatre Of Hate imploded in 1982, with Kirk taking Stan forward to form Spear Of Destiny, but the band has resurfaced over the years to play some very special shows.